World Book Night (WBN) is a super-fun, global effort for book lovers like us to spread the joy of reading by giving away books. While the US’s official partnership with WBN ended in 2014, we at YPG have continued the tradition. This year, we are having our very own ROGUE World Book Night, so be sure to show up on Shakespeare’s birthday, Monday, April 23, to join in on this YPG Cares tradition! WHEN & WHERE: This year we’ll be meeting on Monday, April 23. This year we’re trying something new and are letting our volunteers vote on our location, so please cast your ballot when you sign up. 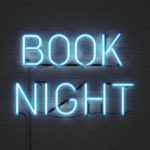 Rogue World Book Night is a no-fuss, no muss event for all book lovers to share their love of reading–so invite your friends, industry or not, to bring their books as well. PLEASE RSVP HERE, and feel free to email Angeli Rafer at arafer@wwnorton.com with any questions.